Using a pestle and mortar or a food processor to pound the lemongrass, ginger and kaffir lime leaves to a paste. If you don’t want to pound the lemongrass and lime leaves you can add them to the broth and remove them later – I find lemongrass too woody to chew on and the leaves whilst fragrant are a little leathery to eat in their entirety unless mulched down! Make a simple broth, using the stock, the paste from lemongrass, ginger and kaffir lime leaves, lime juice, fish sauce, sugar, balancing sweet (sugar), sour (lime juice) and salty (fish sauce) to your taste – the more you make this the easier it will become to adjust measurements to your own personal taste but start with a tablespoon of each and work from there. I prefer a sour taste so increase my lime quantities. If you are going to add coconut milk this will sweeten the base but don’t add until later. The great thing about this style of cooking is that aside from the meat and fish which needs to be cooked thoroughly, everything heats through very quickly – this is probably the quickest supper I make, (not much more than 20 minutes). Once you have your basic broth you can add a little rice now (as this will take about 20 mins to soften) but it is much easier to drop noodles in at the end, I only offer rice as an alternative as Mr H is not a big fan of noodles slopping in his lap!! Noodles can be dropped in at the same time as the prawns right at the end of cooking as they require very little time in the simmering broth. If you are adding the meatballs, now is the time to drop them in to make sure they are heated through thoroughly. The Swedish meatballs are perfect as they are a compact texture that don’t break up in the soup. Pork and Prawn might not seem like natural partners but actually in Asian food (Thai, Vietnamese, Malaysian), they are actually a common pairing. Finally drop in your raw tiger prawns and cook through until just turning pink – again no over boiling or they end up looking like a piece of chewed bubble gum – and have a similar texture! 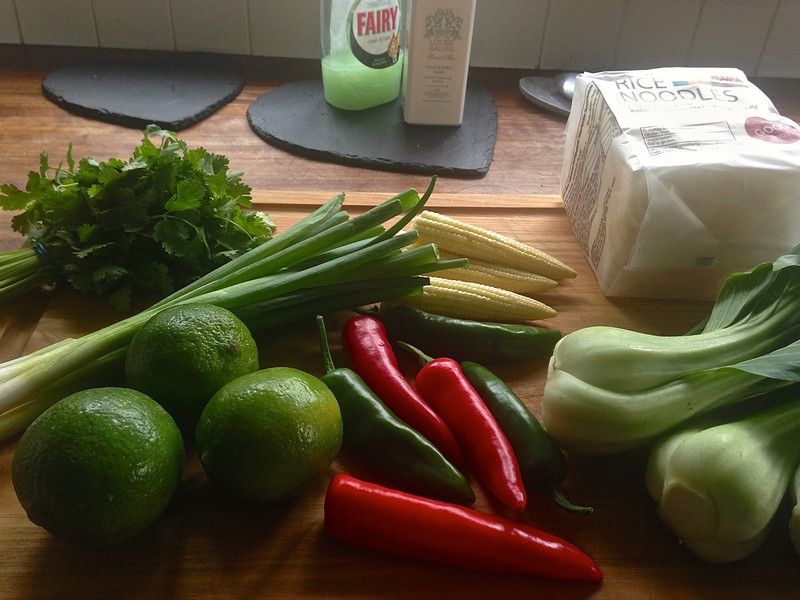 If you want to add coconut milk this can go in just before the prawns …. it is delicious but does have LOTS of calories and actually the broth is delicious without it. 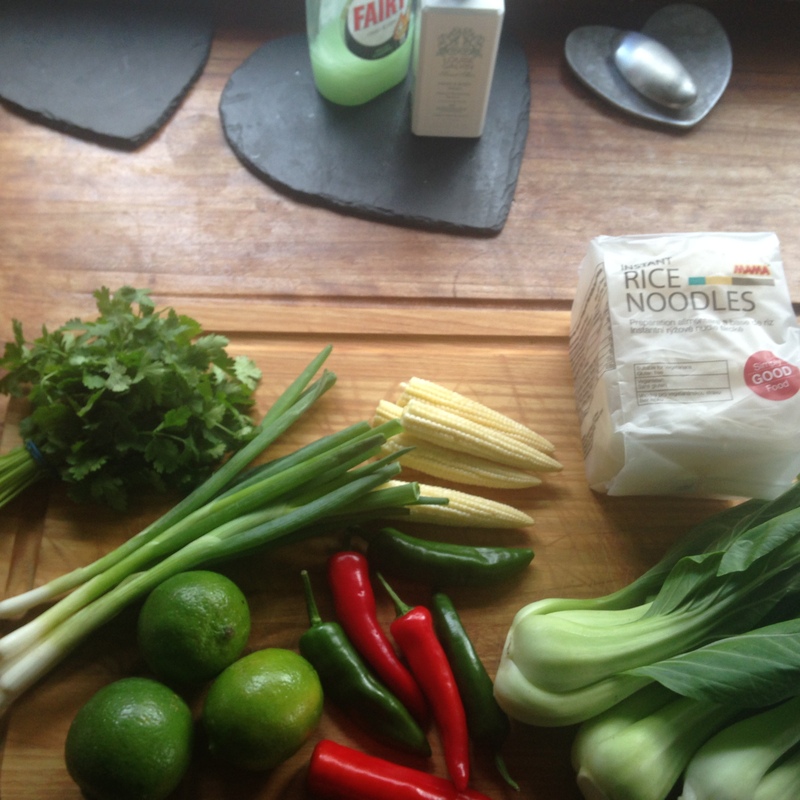 Pick the leaves from your coriander and basil and place in the bottom of your noodle dish and then ladle soup over the fresh coriander leaves in the bowl – this will wilt the herbs without turning them a sludgy green. Jamie Oliver recommends serving his Thai Broth in a glass teapot – which is great if you want to impress at a dinner party but make sure you place the prawns in your noodle dish and not in the teapot or you will get in a terrible mess. Remember you made this for us once – delicious!